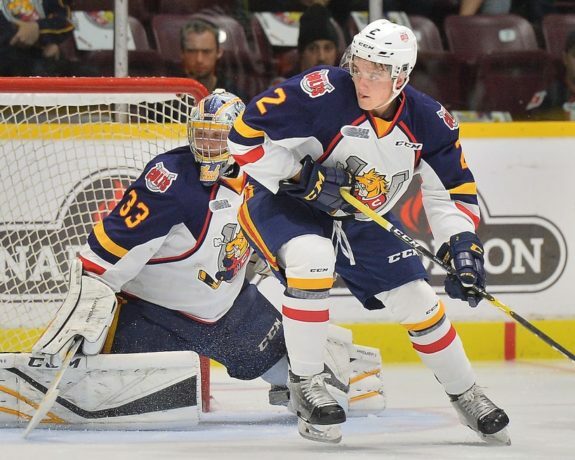 The Barrie Colts have had a strong history of sending well-developed talent to the NHL through the entry draft. In the Dale Hawerchuk era, we have seen the number of players and the quality of talent rise within the Colts system. Alumni players like Mark Scheifele (Winnipeg Jets), Aaron Ekblad (Florida Panthers) and more recently Andrei Svechnikov (Carolina Hurricanes) have gone on to be top NHL talents. With lots of chat circulating hockey-based websites about the next NHL Draft, I felt it would be a good opportunity to take a look at Colts players who have already been drafted by NHL teams. Here are players on the Colts roster who are still developing in the Ontario Hockey League that are readying themselves for future NHL spots. Tyler Tucker was drafted by the St. Louis Blues in the seventh round in 2018. The Thunder Bay native returned to Barrie following a strong showing at the Blues’ prospect camp. Showing off his defensive ability, Tucker proved that he was more than just a player willing to throw big hits. While he was able to score a game winner in three-on-three overtime, he also displayed a readiness to drop the gloves against Derek Pratt who is six years older than Tucker. Tucker made it clear there was more to his game than his defensive abilities. An area the Blues told him to work on this season was his offence. Primarily known as a defensive-defenceman in previous seasons, the Blues wanted to see him work on his 200-foot game. A challenge he took seriously as he has totally changed that aspect of his game. 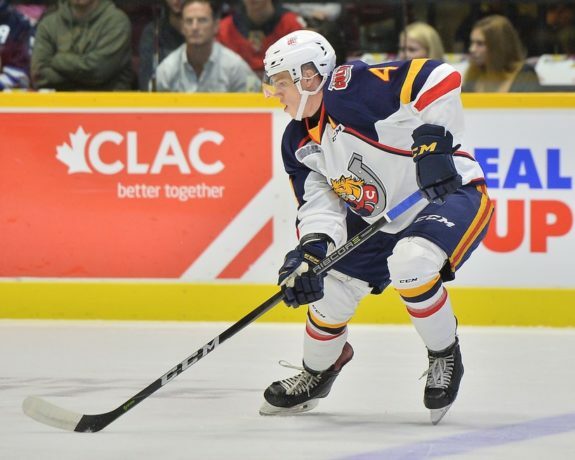 He has scored eight goals and 19 assists through 33 games, doubling his goal total from his previous two OHL seasons with more than half a season remaining. While Tucker has included a more offensive threat to his already-impressive skillset, he hasn’t stopped making body contact. Unfortunately, the OHL doesn’t track hits. He even got some love from Sportsnet for being one of the top-10 biggest surprises in the Canadian Hockey League for his impressive start this season. With the recent trade of team captain Justin Murray, Tucker will get a chance to further his development as one of the more experienced defensemen on the roster. An area he could further work on is finding a way to be aggressive while picking his spots, as he is one of the most penalized players on the team. 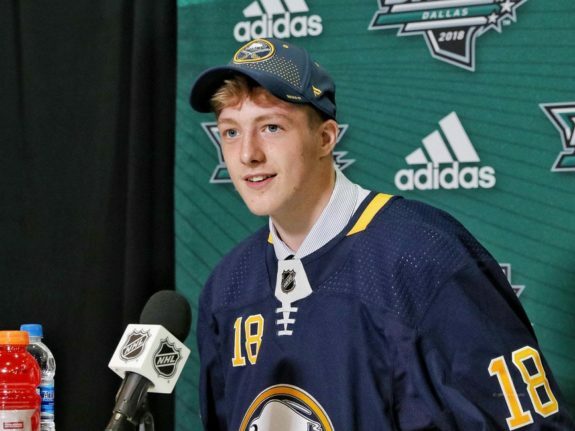 Matej Pekar was drafted by the Buffalo Sabres in the fourth round in 2018 and signed an entry-level deal with the team in October. This offseason, Pekar took part in the Sabres Prospects Challenge. With a deep list of skilled hopefuls who attended camp, he showed many attributes that helped him be one of the players who stood out. Not only did he score a pair of goals while there, he also showed that he can be an aggressive player by displaying physical elements while finding ways to get in the heads of other talented players. Pekar played last season with the Muskegon Lumberjacks of the USHL. He decided to play for Barrie who drafted him at the 2018 CHL Import Draft. He has quickly become one of the team’s top players. Averaging more than a point-per-game this season, he continues to be one of the team’s top producers. As the season progresses, he hopes to work on his ability to score goals. Coach Hawerchuk has also told him to focus on continuing to move his legs, which he has done consistently. Pekar was also named to the Czech Republic preliminary roster for the World Junior Championships. He is aggressive, strong and effective as a playmaker and sniper. However, sometimes he is a little generous with the puck. An area he could improve in would be to become more selfish. Sometimes, instead of forcing the pass, he should just try and put the puck on goal. Joey Keane is a 2018 third round pick of the New York Rangers. He had a great camp with the Rangers and his speed was one of his abilities that stood out the most. It was also said that he was mature and didn’t try to do “too much,” an error made by young players. He always stood out, no matter the situation he was deployed in. Keane was sent back to the Colts in late September to continue his development. He’s had a strong campaign with the Colts, scoring four goals and 16 assists in 29 games. He continues to use his speed and is one of the OHL’s better defencemen in all zones. He isn’t one to shy away from physical play either and plays a hard game along the boards. Keane will get a chance to further his abilities as he was named to Team USA’s Preliminary Roster for the upcoming 2019 World Junior Championships. He has been so strong for Barrie this season. The only area he seems to have struggled has been staying out of the penalty box. Like Tucker, he just needs to find a way to stay physical without crossing the line. The Vegas Golden Knights used a 2017 fourth round pick on goaltender Maksim Zhukov. He came to Barrie in the first round of the 2018 CHL Import Draft. While there was uncertainty that he would arrive in Barrie, Colts GM Jason Ford was confident that it wouldn’t be an issue. You have to think that Colts’ former goaltending coach Mike Rosati, who is currently the goalie coach for the Golden Knights, likely helped nudge Zhukov in Barrie’s direction. This season has been filled with hot and cold moments for Zhukov. Early in the season, he appeared to be the team’s obvious starting goalie. Recently, however, he has struggled with consistency. While the team hasn’t been great defensively at times, it has been Kai Edmonds who has stood out in recent weeks while Zhukov has scrambled to get his game together. In 19 games, he has a 3.43 goals against average and a .900 save percentage. He utilizes the butterfly style well and does a great job going post-to-post to cover the bottom half of the net. An area that he needs to work on is his rebound control. Usually able to make the first save, he allows a lot of his goals against on second chances. Only time will tell which of these players will go on to successful NHL careers. Right now they are all progressing and putting in the required work. The Colts have been struggling this season and though the team has been underwhelming at times, these players are still managing to improve the skills that got them drafted.